I've made a lot of jokes about putting kale into a chocolate cake. Most of my friends don’t approve. I get a lot of eyebrow raises when I say things like that, so I do more standard things like sauté the kale, and everyone shuts up and moves on. I am not alone. Kristen over at The Kale Project told me that she once made kale cupcakes and she got some eye rolls as well. I can commiserate. But, then I ended up with a kilo of kale (that’s a little more than two pounds for those of you not on the metric system), and what else was I supposed to do but get creative? Putting kale in a chocolate cake might not be your first choice in recipe development, but I have a thing about challenging myself to make recipes that incorporate different ingredients, are relatively healthy, and that you could serve to someone and they wouldn’t think twice about what they were eating until you told them. If anyone scoffs at you for making something vegan or gluten-free, it’s just because they haven’t tried a good recipe. All things can be tweaked and suited to any diet. Even chocolate cake. But this isn’t about diets. This is about trying to put kale in a cake just because you can. Challenge accepted. 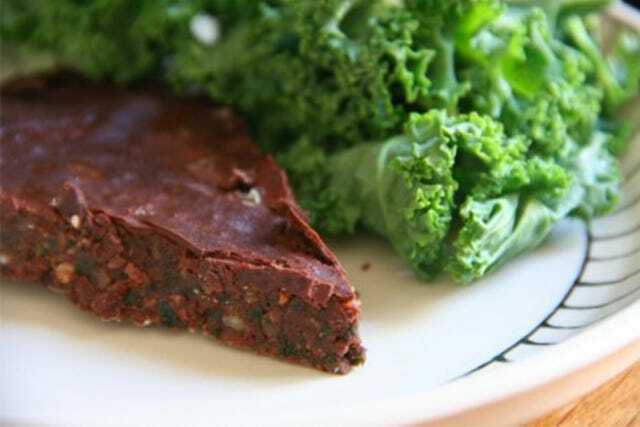 I chopped up some kale, pureed it for good measure, and whipped together a dense, chocolaty batter and hoped for the best. I had of course forgotten that a Frenchman was coming over for lunch. Not just any Frenchman. A chef and owner of an organic restaurant. My first rule of cooking: Don’t ever serve a new recipe to guests. You always want to make sure you have tasted what you are serving first. But, there was no other dessert on hand, and god forbid you serve a French lunch without dessert. Ca ne se fait pas! I grated some candied ginger on top just for good measure, and set out the plates on the table. “It’s gluten free, but you have to guess the secret ingredient,” I said, questioning my sanity of serving anything that I had made myself to a French chef. “Hm…il y a des graines de…. ?” There are little grains of? “Ah oui…des petits bouts de vert….le kale?” Ah yes…the little green bits…kale? Boil two cups of water. Remove from heat and place kale leaves in water. Cover and let sit for two minutes. Remove and drain water, keeping about two tablespoons of the water. In a bowl, whisk together eggs, sugar, and vanilla. Mix in cocoa powder. Add kale puree and olive oil. Mix in flour, almonds and sea salt and stir until well blended. Grease a circular cake pan and dust with ground almonds. Pour in cake batter. Bake at 350 for 10 minutes.